Express your sentiments in your home decor, or give your friends and family the bowl that suits their loves and personality. Just about everyone can benefit from another bowl around the house, be it for decoration or a place to stash receipts, mail, etc. These 11" diameter bowls are individually created in India, in a village near Moradabad. Noah's Ark International, a non-governmental organization (NGO) founded in 1986, provides help to about 100 artisan groups, involving more than 600 people. The metal bowls below are crafted at the workshop of a father of 4 children who has become successful enough in his work to employ 12 men. He lives next to his workshop, and Noah's Ark International sends a teacher to his home so it becomes a local classroom. 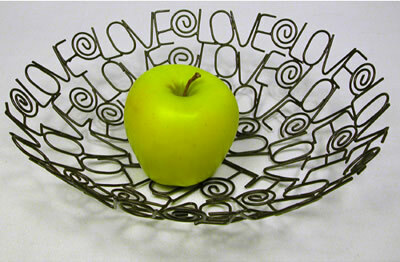 Show your love for someone with this metal bowl that says Love Love Love over and over; they'll get the message. Will you be attending a wedding sometime soon? Use the LOVE bowl as a foundation for a gift basket with a collection of little items to help the happy couple in their new home, starting their lives together. Use this bowl in your house as a reminder to maintain perspective on what's important in your life and in the world. As with each of these bowls, your purchase will help the cause of peace through helping people around the world, one artisan and their family at a time.